Yūna’s a Half-Elf [pathfinder] (Domain: Air) Wizard 5/ Monk 1. 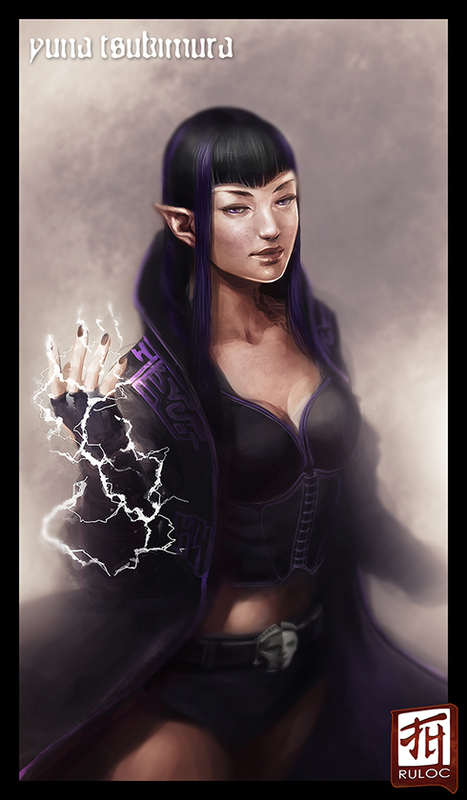 As her speciality is air-based spells, she favours wind and lightning spells, so tends towards the more destructive ones. She will be going into Initiate of the Sevenfold Veil eventually though, which is all about the colours of the prismatic wall, but as prerequisites has her specialising rather heavily in abjuration/defensive spells. She favours speed over strength but isn't weak. She grew up in a human city (steampunk-ish) in an orphanage (taught martial arts), and from 15-24 years old lived aboard a halfling trading ship (taught magic, then the campaign began), who are modelled after Terry Pratchett’s Nac Mac Feegles, so are a little chaotic and love alcohol & money. She can also (through feats) cause sonic damage with a touch, and her domain allows her to cast feather fall & levitate on herself at will (and eventually fly). She stands around 5’8” and walks with calm, graceful confidence. Her long black hair, smooth like silk, dyed with purple streaks in places, reaches almost half way down her back, and her eyes are a deep, dark amethyst colour. She favours her elven heritage, so her ears are elongated, obviously so, and her eyes are slightly wider than a human’s. She has a black tattoo on her left side, from about halfway between her elbow and shoulder to just below her ribs, with a few tendrils poking above her jacket collar on her neck, almost to her jaw line. She has a second tattoo on her right hip, in a similar style but much smaller (maybe up to her bottom rib at most). She also has spellbook tattoos around the edges of the main tattoo on her left arm, and down the outside of her right upper leg (since the world she’s in revolves significantly around Japanese, the text is probably in asian script). She wears a black, long-sleeved traveller’s jacket that almost reaches the floor, with purple patterns decorating the inside (the overall colour scheme is black with purple filigree). Her boots are black leather and reach past her knees, and have purple trimmings. She wears black silk hotpants, and a purple corset with black & white filigree. She has black leather fingerless gloves and a black belt with a black & white buckle shaped like Nethys’ mask (pathfinder god of magic http://www.pathfinderwiki.com/wiki/File:Nethys.jpg ). As far as equipment goes, all you can really see are two leather pouches on the back of her belt, and a purple ribbon wrapped around a lock of hair on one side (it’s a hat of disguise so if you can think of anything else that would fit better feel free). She also has an owl familiar if you want to include him too for practise.